(CNN) -- When Russia bid to host its first Winter Olympics back in 2007, the document quoted an expected cost of around $12 billion. 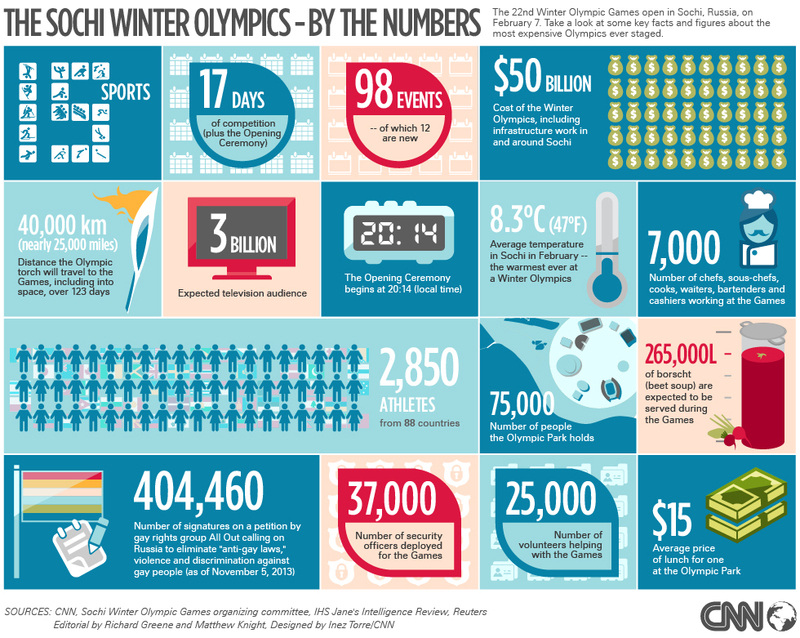 However, as the extensive renovation of the city of Sochi has unfolded in the years since successfully winning the rights to stage the Games, that number has ballooned to around $50 billion -- more than four times over budget. It will be the most expensive Olympics yet, surpassing Beijing's 2008 Summer Games. The Russian government says that much of this has been sunk into infrastructure -- upgrading travel links such as airports and train stations, building new roads, houses, hotels and conference centers and providing the other necessary utilities to welcome thousands of visitors. According to both President Vladimir Putin and his predecessor, the present Prime Minister Dmitry Medvedev, the "sports-related" costs have come to about $6.4 billion. This has largely come from building 10 competition venues, both down on the Black Sea coast in Sochi's Olympic area and up in the mountain cluster in Krasnaya Polyana -- which not long ago had just one ski lift. The Games will launch with the February 7 opening ceremony at the $600 million Fisht Stadium, which will not host any sporting events but will close the Olympics two and a half weeks later. The arena will then be used by Russia's national football team and will host matches at the 2018 World Cup with an expanded capacity of 45,000. With the Olympic cauldron now extinguished, CNN takes a look at whether Russia's $50 billion Sochi budget was money well spent. The athletes on show in Sochi provided moments of drama and destiny that captured the imagination and settled in the collective memory. Russia may have topped the medals table at the first Winter Olympics it staged, but which country was most successful per capita? From eye-popping helmet designs to F1-influenced bobsleigh, the Sochi offered a bewildering array of technological innovation. Sochi's closing ceremony took an artistic look at Russian culture before the Olympic flag was handed over to South Korea for the 2018 Games. The world's most expensive road? Critics say it would have been cheaper to coat this Russian road with caviar but will the route made for Sochi reap long-term rewards? Navigate your way around this spectacular 360-degree picture from Sochi's ski-jumping venue at the Winter Olympics -- and find out how it was created. Sochi's transformation has left even the local cab drivers a bit lost and confused -- but don't let that put you off visiting this rejuvenated Black Sea resort. What do you get if you mix Valentine's Day, thousands of good-looking young Olympians and a popular online dating app? For a Winter Olympics, there are some very colorful characters from some very tropical climates taking part -- including this "Mariachi" skier. If snowboarders were an introduction to a younger, hipper, "slacker" generation of Olympians, the next wave has taken it to another level. He didn't like carpets, he banned portraits and he walked in water rather than swim. Welcome to Joseph Stalin's dacha. Like most skiers in Sochi, Jacky Chamoun had hoped to cause a stir on the slopes rather than off them. It has been dubbed Russia's Las Vegas. But has Sochi's massive renovation come at a cost to the region's stunning natural environment? Take a different look at Sochi 2014 as CNN showcases the most compelling images from the world's best photographers.